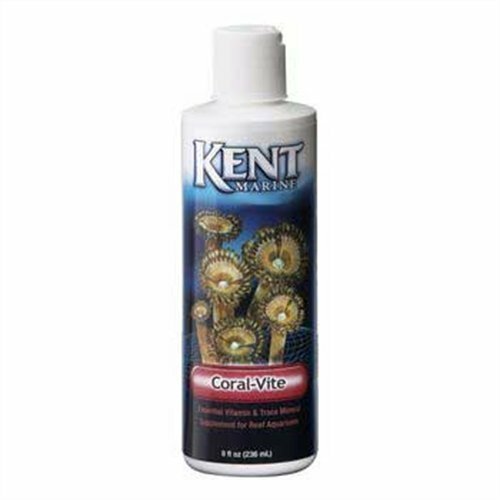 Kent Coral-Vite is the premium hard and soft coral vitamin and mineral supplement. It provides exotic trace minerals and complex nutrients for health and vigor and to stimulate growth in corals, anemones, gorgonians, and desirable marine algae. It contains no detrimental heavy metals, gluconates or other sugars, phosphates, nitrates, or silicates. Coral-Vite does not promote undesirable algae growth. Our goal is to provide SLR or Sustained Long-term Results. To this end, Coral-Vite makes the lightest possible use of EDTA and preservatives. These ingredients are necessary, however, to make sure you get a fresh, potent product. If you have any questions about this product by Kent Marine, contact us by completing and submitting the form below. If you are looking for a specif part number, please include it with your message.